My sock mojo is in full gear right now. I finished up my March socks with the 2016 colorway from The Loopy Ewe for the little knitalong that my friend, S. and I are doing. Then, last night I cast on for another sock that I've called "Verb" using the leftover yarn from block #15 of my Travel Afghan. 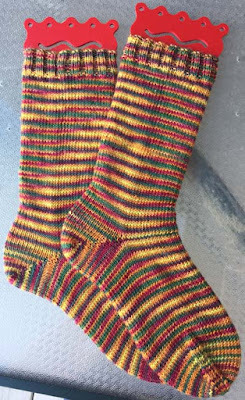 The sock went very quickly and I finished it today. With the "From The Ashes" sock, I now have two single socks that need their mate. I'll be working on them as my main projects this week because next Saturday is cast-on day for the April socks and I don't want 3 single socks. I'd like to have full pairs! While knitting I was watching a couple of video podcasts on You Tube. One is Fruity Knitting that I've mentioned before and is my favorite. I also watched Sticks & Twine. 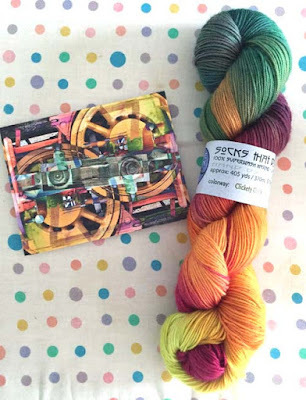 The host talked about a Brooklyn Tweed knitalong that he has started as well as a visit to the Edinburgh Yarn Festival and a side trip to Amsterdam and Stephen West's shop, Stephen & Penelope. The Edinburgh Yarn Festival is on my bucket list. Notes: The colors come from the picture, below. I was pleased that there was no real pooling. The yarn looked like it wanted to pool but the stripes helped to break it up. While these aren't my favorite colors, the socks will get lots of use.